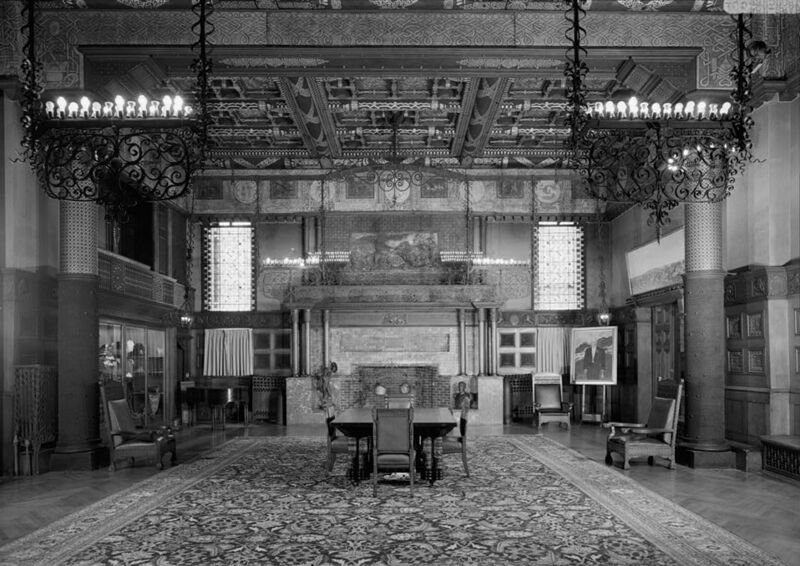 I had the distinct pleasure of delivering a lecture based on my book, America’s Medicis: The Rockefellers and Their Astonishing Cultural Legacy, in the Armory’s magnificent Tiffany, or Veterans, Room. As always with Tiffany, the Victorian adage, “If much is good, more is better,” applies. Still, perhaps because of its ornate wood paneling, the room is surprisingly manly. The ceiling is magnificently and colorfully inlaid, the columns are covered in mosaics, and the enormous fireplaces surmount sports with turquoise tiles, topped with an unusual abstract mosaic. Instead of the customary flowers, the windows of this and the adjoining Silver Room feature a randomly geometric design of opalescent white glass rounds alternating with irregular pale green, yellow, and red rectangles. A magnificent Oriental rug covers the floor. So much for military asceticism! For decades this Armory has housed New York’s Winter Antiques Show, run for the benefit of the East Side House Settlement. This year it honors the 60th anniversary of Historic Hudson Valley, founded by John D. Rockefeller, Jr. The fair, now in its 58th year, has a distinction of its own. Whether or not you are a collector, the show is a must for all those who love beautiful things. This year 75 dealers from all over America and Europe displayed an eclectic mix of objects they had been able to assemble for their clients’ delectation. The atmosphere is so upscale that it is hard to believe that they are actually selling their wares, displayed in the booths that look as if they were over-decorated rooms. My lean wallet and I aimlessly spent two hours gawking at the displays. I had no use for the intricate telescope from J.P. Morgan’s private yacht, a playful carousel horse or a spectacular carpet woven for a Maharajah, but would not have minded picking up a Tiffany desk lamp. It would have fit right into my crowded apartment. This entry was posted in Uncategorized and tagged america's medicis, antiques, east side house settlement, louis comfort tiffany, new york city, park avenue armory, tiffany, tiffany room, veterans room, winter antiques show. Bookmark the permalink.